Banquets available for events such as weddings, rehearsal dinners, company outings, retirements, holiday fare, charitable events, informal buffets, family events, and showers. Banquet menus are individually prepared to include custom items, seating, cocktails and amenities. Timbers staff would be happy to supply you with packages enhanced to suit the size and nature of your banquet. From informal buffets to pre determined menus, we can set these and other simple and stress-free arrangements. 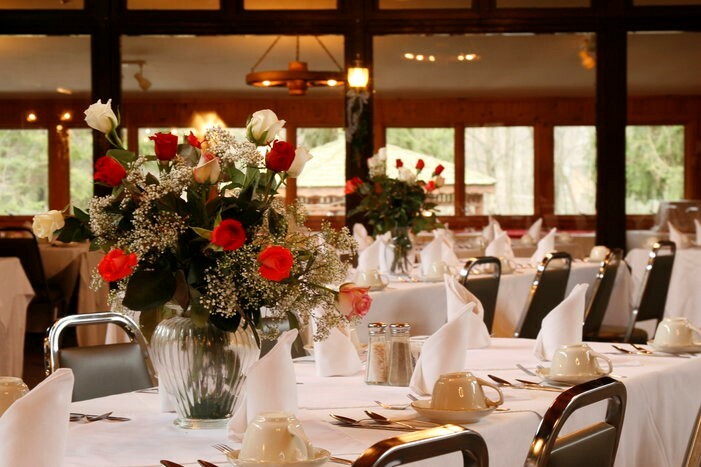 Offering year `round dining, banquet facilities and summer dinner theatre, the Timbers is the perfect place to celebrate anniversaries, birthdays, graduations, and to simply enjoy an evening out with family and friends. Thanks to all the loyal support from near and far, the Briody family has been fortunate to serve the Central Pennsylvania area for over forty years in many capacities. Located one mile up Timbers Road, amid the pines of Mt. Gretna, our Mt. Gretna community, commonly known as a summer spot, has really grown into a year ’round respite. The Timbers offers something for everyone with a variety of menu options and different sized banquet rooms for all. Banquets tailored to style and needs, with plenty of parking and scenic grounds. The Timbers, readily available in beautiful Mount Gretna. Additional charges not included are tax & gratuity, bar beverages. Timbers has PA State Liquor and Foods licenses.